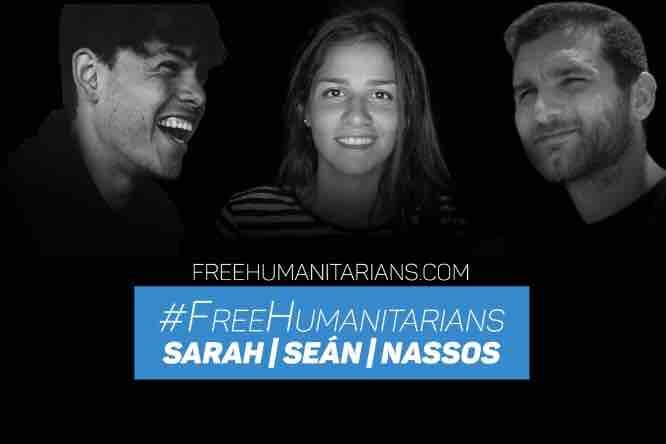 Free Humanitarians Nassos Karakitsos, Seán Binder & Sarah Mardini are three humanitarian workers who have been arrested and detained by Greek Authorities for almost 3 months! Their pre-trial detention can last for up to 18 months. All three volunteered extensively on Lesvos island working for a Greek Humanitarian non-profit organisation working with refugees. They now face serious accusations including people smuggling, espionage, money laundering, and being a member of a criminal organisation. All three strongly deny all charges and accusations. Human Rights Watch stated about the case: "The criminal accusations brought by Greek prosecutors against activists for their efforts to rescue migrants and asylum seekers at sea appear entirely unfounded". “Accusations of money laundering, people smuggling, and espionage appear no more than an effort to criminalize humanitarian activism on behalf of refugees and migrants in Greece" Read full Press Release: Human Rights Watch Press Release By donating, support will be provided to Sarah, Seán and Nassos who are currently in pre-trial detention. The aim is to cover their basic costs for food and telephone cards which allow them to communicate with the outside world. Furthermore, donations will also be used to support their legal representation as well as the transportation costs of their families who visit them in the prisons of Athens and Chios island. All invoices will be directly paid via bank transfer. In cases where invoices have been paid in advance or in cash, the family members will be reimbursed and the invoices added to the google drive. The funds will be deposited to a bank account set up specifically for the purpose of the campaign and the funds will be managed by a team of former volunteers. Thank you to every single one of you who has donated so far! Sarah, Seán and Nassos have been released on bail! This is fantastic news and without your support this would not be possible. We have used the donations to also cover expenses related to the logistics for getting the bail in time and the procedure as well as making sure they had everything they need as soon as they were released! Stay tuned for more updates!